When construction zones encroach on sidewalks or crosswalks, pedestrians may suddenly find they have to make detours that are unsafe, difficult to navigate, or both (see figure 21-1). They may be forced to choose between picking their way through the construction site or walking in a busy street. Projects that re built in phases and construction zones that change weekly or even daily only add to the problem. Bicyclists also experience difficulties when traveling through construction zones, particularly when roadway space is constrained and pavement conditions are rough. In some instances, sudden pavement changes in construction zones can represent a severe hazard to bicyclists. In all such cases, it is important to ensure that bicycle and pedestrian detour routes are accessible and signed for all users. Figure 21-1. Utility work in bike lanes can often be accomplished without blocking the entire lane. 21.4 Planning and Design Considerations. 21.6 References and Additional Resources. Advance warning and guidance signs. Adequate illumination and use of retroreflective materials. Channelizing and barricading to separate pedestrians from traffic. Temporary curb ramps and pedestrian signals where appropriate. Measures preventing visually impaired pedestrians from entering work zones. Warnings to bicyclists about surface irregularities and maintenance of areas where bicyclists can pass through construction zones. Circumstances requiring temporary walkways and/or bikeways. Contractors should be allowed flexibility as long as requirements are met. Because many traffic control decisions are made daily in the field, it is often difficult to plan ahead. All parties involved should be made aware of the needs of pedestrians and bicyclists and be made responsible for ensuring safe and continuous passage. Many agencies require contractors to maintain access on the same side of the street. Near work zones where higher volumes of pedestrian traffic or school children exist, pedestrian fences or other protective barriers may be needed to prevent pedestrian access into a construction area. Barriers should be made of sturdy, non-bendable material such as wood. Pedestrian fences should be at least 2.4 m (8 ft) high to discourage pedestrians from climbing over the fence and should be (cane) detectable by vision impaired. Short intermittent segments of temporary traffic barrier shall not be used because they nullify the containment and redirective capabilities of the temporary traffic barrier, increase the potential for serious injury both to vehicle occupants and pedestrians, and encourage the presence of blunt, leading ends. All upstream leading ends that are present shall be appropriately flared or protected with properly installed and maintained crashworthy cushions. Adjacent temporary traffic barrier segments shall be properly connected in order to provide the overall strength required for the temporary traffic barrier to perform properly. Adequate light and visibility for nighttime use and safety. Proper sight distance at intersections and crosswalks. 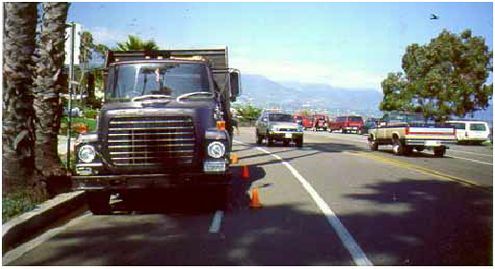 Adequate and impact-resistant longitudinal separation from vehicles on higher speed streets; for work zones adjacent to high speed traffic, wooden railings, chain link fencing, and other similar systems are not acceptable. It is undesirable to close sidewalks or pathways during construction. This should be the last option. If sidewalks have to be closed, construction sites should provide alternative pedestrian routes, safe crossings to the other side of the street, and easy-to-read and distinguishable signs and placement markings. Temporary walkways must also be safe and clear of obstructions such as debris, potholes, grade changes, and mud. If a temporary route is created in the roadway adjacent to the closed sidewalk, the parking lane or one travel lane in a multilane street may be used for pedestrian travel, with appropriate barricades, cones, and signing, as illustrated in [f]igure 21-2. When using a barricade, it must be a continuous route, detectable by a cane. When a parking lane or travel lane is not available for closure, pedestrians must be detoured with advance signing in accordance with the MUTCD. For midblock construction, signs should be placed at the nearest intersection to forewarn pedestrians of a sidewalk closure. Signs should also be placed to avoid blocking the path of pedestrians. Pedestrians should not be led into conflicts with work site vehicles, equipment, and operations. Pedestrians should not be led into conflicts with vehicles moving through or around the work site. Pedestrians should be provided with a safe, convenient path that replicates as nearly as practical the most desirable characteristics of the existing sidewalk(s) or a footpath(s). Mark temporary crosswalks if they are relocated from their previous location. Maintain access to pedestrian pushbuttons. Include pedestrian phases in temporary signals. Place advanced signing at intersections to alert pedestrians of midblock work sites and direct them to alternate routes (consider all users). Figure 21-2. Illustration. Example method to create passageways for pedestrians during construction. The most desirable way to provide visually disabled pedestrians with information that is equivalent to visual signage for notification of sidewalk closures is a speech message provided by an audible information device. Devices that provide speech messages in response to passive pedestrian actuation are the most desirable. Other devices that continuously emit a message or that emit a message in response to use of a pushbutton are also acceptable. Signage information can also be transmitted to personal receivers, but currently such receivers are not likely to be carried or used by pedestrians with visual disabilities in temporary traffic control zones. Audible information devices might not be needed if detectable channelizing devices make an alternate route of travel evident to pedestrians with visual disabilities. When existing pedestrian facilities are disrupted, closed, or relocated in a temporary traffic control zone, the temporary facilities shall be detectable and include accessibility features consistent with the features present in the existing pedestrian facility. Provisions for continuity of accessible paths for pedestrians should be incorporated into the temporary traffic control process. Pedestrians should be provided with a reasonably safe, convenient, and accessible path that replicates as much as practical the desirable characteristics of the existing pedestrian facilities. Access to temporary transit stops should be provided. Blocked routes, alternate crossings, and sign and signal information should be communicated to pedestrians with visual disabilities by providing devices such as audible information devices, accessible pedestrian signals, or barriers and channelizing devices that are detectable to the pedestrians traveling with the aid of a long cane or who have low vision. Where pedestrian traffic is detoured to a temporary traffic control signal, engineering judgment should be used to determine if pedestrian signals or accessible pedestrian signals should be considered for crossings along an alternate route. When channelizing is used to delineate a pedestrian pathway, a continuous detectable edging should be provided throughout the length of the facility such that pedestrians using a long cane can follow it. A smooth, continuous hard surface should be provided throughout the entire length of the temporary pedestrian facility. There should be no curbs or abrupt changes in grade or terrain that could cause tripping or be a barrier to wheelchair use. The geometry and alignment of the facility should meet the applicable requirements of the ADAAG (see [s]ection 1A.11). The width of the existing pedestrian facility should be provided for the temporary facility if practical. Traffic control devices	and other construction materials and features should not intrude into the usable width of the sidewalk, temporary pathway, or other pedestrian facility. When it is not possible to maintain a minimum width of 1500 mm (60 in) throughout the entire length of the pedestrian pathway, a 1500 by 1500 mm (60 [by] 60 in) passing space should be provided at least every 60 m (200 ft), to allow individuals in wheelchairs to pass. Signs and other devices mounted lower that 2.1m (7 ft) above the temporary pedestrian pathway should not project more than 100 mm (4 in) into accessible pedestrian facilities. See figure 21-3 for an example of a crosswalk closure and pedestrian detour. Developing a workable policy for bicycle and pedestrian access through construction zones requires the cooperation of traffic engineers, construction inspectors, crew chiefs, contractors, and advocates. The policy should apply whenever construction or maintenance work affects pedestrian or bicycle access, whether the work is done by private firms or city, county, or State crews. To develop the above policy, permits required for street construction or construction projects that encroach upon sidewalks or crosswalks should be contingent upon meeting bicycle and pedestrian access policies. Contractors should be given copies of the standards when they apply for a permit. Preexisting standards or a policy that is readily available will prove useful for incorporation into contracts, agreements, or specifications. Many road, pavement, maintenance, or utility projects use permanent city crews to do the work. Crew chiefs and crews should be educated to ensure that they understand and follow the policy. Enacting pedestrian and bicycle access policies for work zones are not expensive. The main costs involve developing the policy, training crews and construction inspectors, and imparting information to contractors. Ongoing costs will involve work site inspection. Figure 21-3. Illustration. Sidewalk closure and pedestrian detour example. While the 2003 MUTCD pedestrian guidelines apply to pedestrian traffic around work zones, the absence of specific guidance on pedestrian access around construction zones leaves local agencies with a great deal of flexibility. Keep in mind that MUTCD silence on this subject may lead some in an agency to balk at establishing hard and fast regulations. Construction operations on rural highways affect mostly touring and recreational bicyclists; pedestrians are seldom encountered in rural settings. On low-volume roads or through short construction zones, standard traffic control practices are usually adequate. Bicyclists can ride through without impeding traffic. Their needs can be met by maintaining a paved surface and removing temporary signs, debris, and other obstructions from the edge of the roadway after each day’s work. On high-volume roads or through long construction zones, enough paved roadway width should be provided for motor vehicles to safely pass bicyclists. Flaggers and pilot cars should take into account the bicyclists’ lower speeds. When bicyclists are coming through, radio messages can be relayed to other flaggers. On highways with very high traffic volumes and speeds, and where construction will restrict available width for a long time, it may be advisable to provide a detour route for bicyclists where possible. The detour should not be overly circuitous. Directional signs should guide bicyclists along the route and back onto the highway. Through-bicycle movement must also be maintained. Bicyclists can share a lane over a short distance. On longer projects and on busy roadways, a temporary bike lane or wide outside lane may be provided. Bicyclists should not be routed onto sidewalks or onto unpaved shoulders. Debris should be swept to maintain a reasonably clean riding surface in the outer 1.5 or 1.8 m (5 or 6 ft) of roadway. Bicyclists have a low tolerance for surface grade changes and excessive bumps should be avoided. The placement of advance construction signs should obstruct neither the pedestrian’s nor the bicyclist’s path (see figure 21-4). Where this is not possible, placing signs half on the sidewalk and half on the roadway may be the best solution. Figure 21-4. Illustration. Construction sign placement. The City of Seattle, WA, has developed specific policies for pedestrian access, control, and protection in work zones. These policies are detailed in the City’s Traffic Control Manual for In-Street Work. (3) The purpose of the manual is "to set forth the basic principles and standards to be observed by all those who perform work in public streets so as to provide safe and effective work areas and to warn, control, protect, and expedite vehicular and pedestrian traffic." Before any in-street work is started, all persons performing work within the street right-of-way must first obtain a permit by submitting and receiving approval of a traffic control plan. To protect pedestrians, the manual describes procedures for erecting protective barricades, fencing, and bridges, together with guidance devices and signs. Whenever passageways or walkways are affected by construction, access for pedestrians and disabled persons is ensured. Access to recommended school crossings must be maintained at all times. Where walkways are necessarily closed by construction, alternate walkways, including temporary curb ramps, must be provided. Where alternate walkways are not feasible, signs are required at the limits of construction and in advance of the closure at the nearest crosswalk or intersection to divert pedestrians across the street. Pedestrians must never be diverted into a portion of the street concurrently used by moving vehicular traffic. Where required, fixed pedestrian ways using fences and canopies shall be considered. Adequate illumination and use of retroreflective materials are required during hours of darkness. Figure 21-5. Illustration. Pedestrian control. Figure 21-6. Illustration. Pedestrian control. Identify several work zone locations and determine what elements of accommodation are being made. Are there others that could be made or might be more appropriate? Survey the location for several hours during the peak traffic period and determine if pedestrians are using the facilities in place. Do they violate the channelization? Why do they violate it, and are they endangering themselves? What can be done to improve the situation? "Toolkit 11: Safety in Work Zones," Pedestrian and Streetscape Guide, Georgia Department of Transportation, Atlanta, GA, November 2003, available online at http://www.dot.state.ga.us/DOT/plan-prog/planning/projects/bicycle/ped_facilities_guide/index.shtml, accessed April 23, 2004. MUTCD, USDOT, FHWA, Washington, DC, 2003, available online at http://mutcd.fhwa.dot.gov, accessed March 21, 2003. Traffic Control Manual for In-Street Work, Fourth Edition, Seattle Department of Transportation, Seattle, WA, 1994, available online at http://www.seattle.gov/transportation/trafficcontrolmanual.htm. Oregon Bicycle and Pedestrian Plan, Oregon Department of Transportation, Salem, OR,1995. Implementing Pedestrian Improvements at the Local Level, USDOT, FHWA, Publication No. FHWA-98-138, Washington DC, 1998, Available online at http://safety.fhwa.dot.gov/ped_bike/docs/localpedguide.pdf, accessed March 9, 2004.